Awesome hunting power! 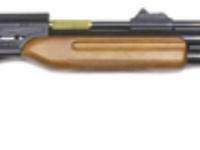 The Career Fire 201S is a single-shot 9mm hunting rifle that takes game at distances previously reserved only for firearms. 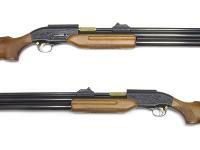 Dual power levels, which are regulated by the bolt-action cocking mechanism, give you greater control over velocity and energy. On low power, our 100-grain 9mm pellet leaves the barrel at approx. 700 fps (over 108 ft-lbs.). On high power (approx. 900 fps), the same pellet delivers almost 180 ft-lbs. of energy! The massive loading port makes it easy to load pellets...an important feature when you've got to quickly make a followup shot. The front sight is a hooded bead, while the rear is fully adjustable for windage and elevation. The hardwood stock is checkered Indonesian hardwood and comes with sling swivel eyes already installed. If you're going to hunt with this rifle, then adding a sling will make it convenient to carry it for longer periods of time. A quick glance at the built-in air pressure gauge makes it easy to determine when you need to fill up with more air. 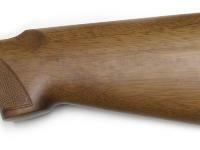 A hard Plano rifle case (PL1502) is strongly suggested. Don't forget to click on the AMMO link to stock up on our pellets. 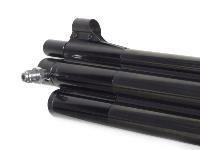 The ACCESSORIES link has a list of products to put air into your gun (scuba tanks, electric compressor and hand pumps), paper targets and maintenance items. Things I liked: Powerful, accurate, and fairly light, easy to fill, load, and shoot. Doesn't seem too picky when it comes to pellets/accuracy.. Things I would have changed: Automatic safety would be nice. Tighter fit for the pellets in the loading port/breach part of the barrel, pellets tend to fall into the brass bushing when holding the rifle upwards.. 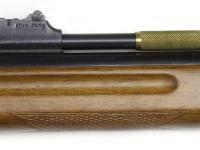 If you fire the gun with the pellet in the brass bushing, the pellet will jam in the breach. 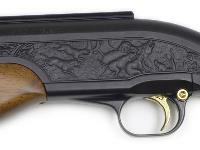 What others should know: this is a serious hunting rifle capable of getting the larger animals. when i first fired this gun it sounded like a 30-30 deer rife with tremendous power coming out of the barrel. 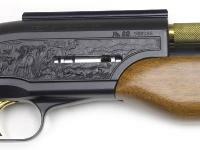 love this gun- simple to use-not a back yard plinker. Things I would have changed: Nothing.....! Incomparable power, awesome accuracy, 2 power levels and a built-in air-pressure gauge.